We all know that yoga is great for your health and happiness. And if you’re lucky enough to work for one of these companies, your boss knows it too! 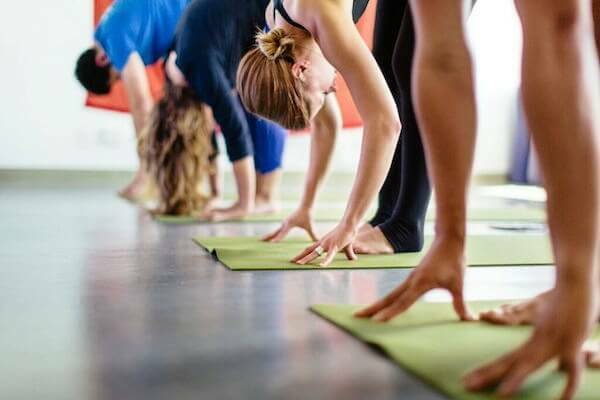 We talked to five different companies who all offer yoga classes to their employees as one of the perks of working there, to see how it benefits productivity and happiness. So if you're looking for a new job where you can get your asana on, or if you just like seeing what's around, check out this list of wonderful companies that offer yoga to their employees, and why yoga at work, well...works. How long have you offered yoga classes to your employees for? Are they popular within the company? We have been offering yoga to Patagonia employees for 25 years! Patagonia founders Yvon and Malinda Chouinard were the ones to start the yoga program when they hired Patagonia’s first yoga teacher, Maura Patrice. The classes are incredibly popular. We offer classes at the corporate offices and in Patagonia retail shops. Classes are always full, and all yoga classes are free for employees. How has your employee yoga program impacted employee health and happiness? The classes really do impact employee health and happiness in a wonderful way. As we all know, taking the time to stop and breathe is so incredibly important for the mind and body. Patagonia has a very positive, collaborative work environment, and the yoga classes absolutely contribute towards that. Recently, a group of regular Patagonia yogis have started a meditation session in the late afternoon as well! Though we have never conducted any official studies on yoga impacting productivity at Patagonia, we can say without question that it has a positive effect. Would you recommend other companies to offer yoga classes to employees? Absolutely. There is no down side to offering yoga classes to employees -- taking the time to pause, breathe, stretch, and collaborate with other employees away from the computer screen is so important. MONOQI, a company that finds designers from around the world and makes it possible for you to find the perfect design for you, also offers yoga to their employees. We've been offering yoga classes to our employees since June 2015. They are highly popular and the number of participants has increased significantly since day one. Our employees truly enjoy the classes, and we can see a positive impact on their happiness and balance. The very appropriately named company Asana, which helps business teams track their work, loves the effect yoga classes have had on their employees. Asana has offered classes to the company since its founding, and they are generally pretty well-attended. We offer classes that fit into employees' schedules and we try to gear our classes toward small groups so that each employee gets personalized attention and can get the most out of their practice. Our program has had an immense impact on our team's health and happiness. The company's self-report surveys suggest overwhelming satisfaction with the variety of yoga offerings, and teachers often will relay how students comment how it's the perfect beginning or end to their days. Yes! Yoga is a great mind-body-emotions-breath (and spirit!) wellness package deal compared to other forms of exercise or wellness, and, with time, we see how the value outweighs the cost. Plus, it encourages camaraderie and community within the company! MVF Global is a lead generation company based in London. They help other companies find customers for their business -- and help their own employees stay on top of their game with some after-work yoga. Yoga is by far one of the most popular exercise groups we run at MVF -- we host two classes a week to cater for demand! Our yoga sessions have been running for about four years, and we have always worked with the same instructor, who our staff have developed a great relationship with. Running the yoga classes after work certainly helps our employees unwind quicker at the end of the day or re-energize for any evening plans, meaning no one ever leaves work feeling exhausted. It’s also been a great way of getting people from different departments to socialize outside of work, which has been excellent for new starters who join the organization, and for general team building. We advocate yoga in the workplace for companies who are looking for an easy, cost-efficient way to improve their employees’ wellbeing and work-life balance.